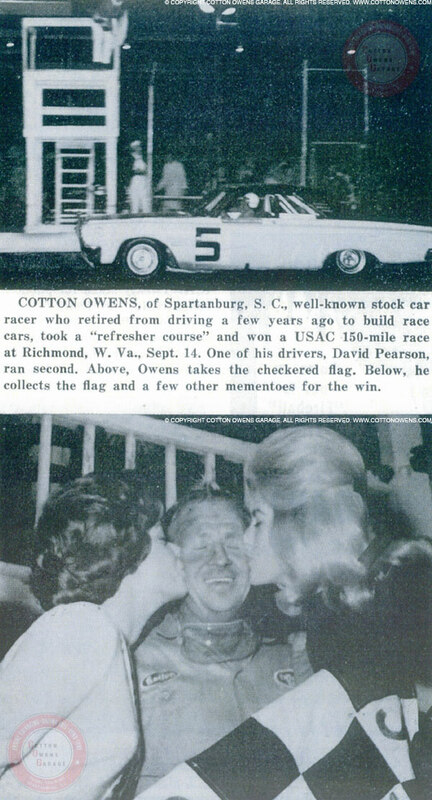 David Pearson was considered one of the most savvy drivers in NASCAR history, but even the Silver Fox needed to learn a valuable lesson in the 1964 Capital City 300 at the Atlantic Rural Fairgrounds, now known as Richmond International Raceway. And the teacher was none other than Cotton Owens, recently selected as one of the five newest nominees for the NASCAR Hall of Fame. The 29-year-old Pearson was in the midst of his breakout season. The surprise winner of the 1961 World 600 at Charlotte, Pearson had gone winless the next two seasons, including as driver of Owens' Dodges in 1963. But Pearson broke through with a victory at Richmond in March and went on to record seven more short-track wins during the summer of 1964. Owens was considered "King of the Modifieds" in his younger days, winning more than 100 features during his career. And he had had pretty decent success at the Cup level, scoring Pontiac's first win in the series at Daytona Beach in 1957. But he hadn't raced competitively in two years and was more interested in building and owning cars. However, Owens felt that Pearson was trying to do too much on his own. So when the series returned to the fairgrounds on the east side of town on Sept. 14, 1964, Owens entered a second car with the idea of showing the young buck how things should be done. "I was talking to David about how it took more than just the driver to win races," the 86-year-old Owens said Thursday from his shop in Spartanburg, S.C. "It had to be a whole team effort. He came through the ranks like I did. "In Modifieds, you didn't need nobody but yourself. So he had to be talked to, to learn that it had to be a team effort. That was the reason why I came out of retirement, to show him I could use the pit crew there and win the race." Owens was impressed with the raw talent Pearson -- also a native of Spartanburg -- possessed, especially on dirt bullrings. And Owens knew how to build fast cars. "I always had a good working deal with dirt, with all of my cars," Owens said. "Most anybody could drive them on dirt. "Pearson, he drove more like I did. That's the reason why I liked his style of driving. You just couldn't beat him. At any race track he went to, you had to work hard to beat him." The car had finished fifth with Jim Paschal behind the wheel in the Daytona 500, so Owens knew it was as competitive as Pearson's ride. "They were both '64 Dodge Coronets with the Hemi engine," Owens said. "I actually was one of the last to qualify and I tied the outside pole man, which gave me the second-fastest time." Owens started third, with Pearson ninth. Billy Wade took the pole in his Mercury, while Junior Johnson's Ford was fourth-fastest. And those four cars dominated all day, with Wade and Johnson swapping the lead throughout the first half of the 300-lapper, with Owens and Pearson staying in contention. With Wade fading and eventually dropping out with engine issues, Owens passed Johnson for the lead on Lap 170 and led the next 17 circuits. But Johnson went back in front and appeared to have enough to hold off the two Dodges until his engine let go 36 laps from the finish line. At that point, Owens had a full lap advantage on Pearson and won going away. He remembered being exhausted by the time he pulled in for the post-race celebration. "I gave out at the end of that race," Owens said. "I couldn't lift my arms at the end of that race, I was so tired." Just to hammer home the point, Owens raced again the following weekend at Hillsborough, N.C.
"I was leading the race there and I had a deal with the right rear tire," Owens said. "Every time I'd back off the throttle, it'd start sliding the right rear tire. And I couldn't get in the throttle and Ned Jarrett could, and I ran second." Pearson apparently got the message. Two years later, he piloted Owens' cars to 15 wins and the 1966 NASCAR championship, and went on to amass a total of 105 victories and three championship trophies. During six seasons, the two combined for 27 wins in 170 races. And what did Pearson say to his boss after that race in 1964? "I don't remember exactly," Owens said. "I think he was pretty mad about it. I don't think I outdrove him or anything. It was just a teacher teaching a young one how to do something."